^^The Great Sand Dunes in Colorado. I miss the cool weather! and our dog, even if she does hate taking pictures. You all had some really fun questions for the Ask Us Anything! There were lots of questions and I decided to put them into categories. I did two vlogs and then I'll be writing out some of the answers too. Do you all prefer vlogs or written answers? Today I answered questions about home in America! Hope you enjoy it. and because Dave insisted and because I love Dave I'm posting the 'blooper' video. Dave says it is hilarious which I don't agree at all. Do you have more questions? The forum is still open! Did any of our answers surprise you? The second video with the boxing glove punch is by far the best. COME TO OKLAHOMA!!!! haha :) You're so cute. I liked the vlog because I got to see your beautiful face! One suggestion for your next vlog: I like when people do vlogs and they put a list of the questions they're answering below the video, just so I know what to expect! I got to hear your voice! :) For some reason, vlogs always make me super excited because I get to hear and see the blogger behind the blog. And yours did not disappoint! I love that picture at the top! And I SO enjoyed both videos! I love how you are okay not knowing what your future holds- you seem to say it so matter of factly that God knows and He'll have to work it out. I love it- it's so inspirational to me! I'm so excited to hear more Q&As! Some days I am at peace knowing God has everything taken care of and other days I want to scream and panic. So I'm still learning too. However, the more I think about it the more I realize that panicking won't accomplish one thing because I'll have to go back to square one of trusting. I'm a work in progress but I'm glad God helps us progress! I'm glad you got to hear my voice. I always like hearing other people do a vlog but I always think it is weird to hear my own voice. I am not 100% sure why life is less busy over here but it is. I know other people here are really busy so I'm guessing not everyone feels that way. I just know before I moved to Korea in 2012 I would go from 7am to 10pm at night and that wasn't working for me. It still feels a little weird to not be 'busy' but overall it has been good for me and Dave. So, I'll enjoy this season of life because I'm sure we will have busy seasons again in the future. I'm glad you liked the blooper video. I was mad and laughing at the same time that Dave did that. He thought it was HILARIOUS! I like how you phrased it of saying no to good things and yes to better things! It really is true and is hard to put into practice. Dave always tells me that if I say no to something I am saying yes to something else. That has helped me a lot through the last couple of years. If we end up back in Oklahoma I will laugh and cry at the same time. They still haven't filled Dave's previous position so who knows. However, when I ask Dave about moving back there he says he doesn't know if that is where God wants us. So who knows! God will have to figure all of that out for us, and He will! I just need to keep trusting Him, which sometimes is hard because I like to PLAN. Thanks for the suggestion of putting questions! I"ll have to do that for my next video. And it's really quite an interesting dynamic. I've read in a few articles that people are essentially addicted to stress and busyness and I feel like American's don't see people as productive if they aren't busy--or maybe that's just what I see? Anyway, I'm glad you get to enjoy that part of living abroad and that you're making the most of it, too! PS - that picture was taken at the Great Sand Dunes and they aren't too far from you! You should go!!! I think I knew that either from recognizing the picture or reading about it in a previous post! 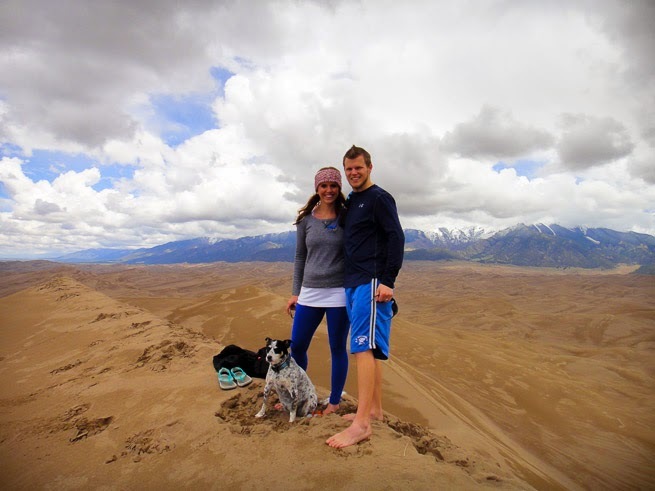 We love the great sand dunes, we try to go camping there at least once a year! So fun! oh my gosh oh my gosh- I LOVE THE BLOOPER VIDEO. BAHAHA sorry I love the other one two- but it made me laugh because all I could think about was how Tom would do that to me. Can't wait to meet you TWO!!!! I'm glad it made you laugh! I laughed and then I got real mad and told Dave he had ruined my vlog ;) ! He still insisted that it was hilarious, which I guess it is! Next month will be here soon, friend!!! Can hardly wait!